Falling Into Some Kind of Routine, Controlled by Meds? Some good news, Amelia came out of intensive care late Friday evening as the red blood cells have increased and the #NaughtyBloodCells have dropped. Amelia now has her own isolation ward at St George's. Daddies hands have never been so clean! We are stumbling into some kind of routine, this is really due to the fact that meds are due very regularly and we have to work around them. Bloods are being taken every 6/8 hours and we have had some great results, the #NaughtyBloodCells were 598 on Wednesday night on being admitted and now are down to 91.6 (a normal level should be 6-13), we need to ensure that we keep our feet on the ground as it's very easy to fall into a false position. This means that the meds are doing what there suppose to do. 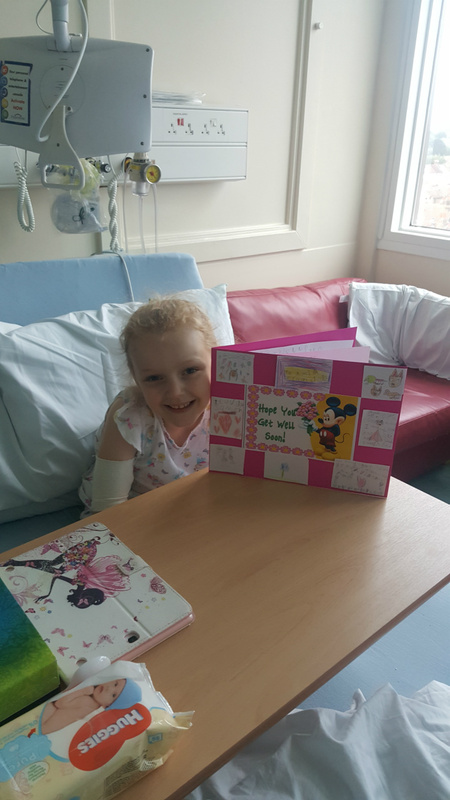 Woodpeckers class from Amelia's school have done a wonderful get well soon card, Amelia loved it and Mummy and Daddy have put it up, pride of place! Amelia even done some drawing on the whiteboard today, oh and Amelia's new room is on the 5th floor, much to Mummy's and Amelia's enjoyment because we know how much Daddy loves heights!